Vancouver's craft beer scene has exploded over the last decade and new craft breweries are opening across BC, rivaling Seattle and Portland for choice. There are now enough Vancouver craft breweries that you can make an entire trip to Vancouver that's just about beer! Here are 10 of our favourite Vancouver breweries inside the City of Vancouver. 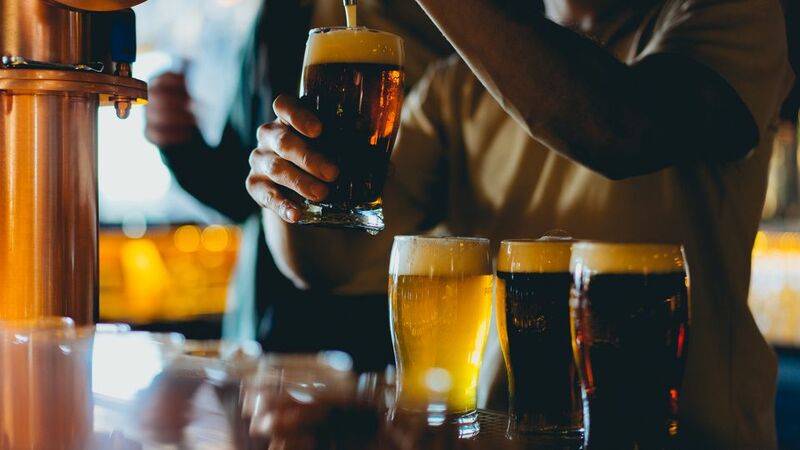 For options throughout the Lower Mainland (including Burnaby, Delta, and North Vancouver), check out this exhaustive list from Vancity Buzz or Growler, BC’s craft beer magazine. Creating your own brewery tour is more fun, but if you'd enjoy an organized tour, Vancouver Brewery Tours offer just that. East Vancouver (or ‘Yeast Van’) has the highest concentration of breweries and is only a 15-minute drive or bus ride out of town. If you’re going at it alone, start with the central stalwarts that helped blaze a trail for new breweries. Granville Island Brewing (1441 Cartwright Street) is Vancouver's oldest microbrewery, and you can sample the beers and tour the facilities at Granville Island. Steamworks Brewery (3845 William Street) is both a brewery and a restaurant with a gorgeous location on the Downtown waterfront. Look out for the mural on the wall to find Vancouver’s ‘longest running craft brewery’ in gritty East Vancouver at 310 Commercial Drive. Enter through the loading bay and you’re in the working brewery, so watch out! Brewer James Walton has been brewing up unpasteurized beer for nearly 25 years and you’ll only find fresh beer here — there are no cans or bottles in sight. Fill up a growler or get a taste at a local restaurant — Storm’s ‘Brainstorm’ beers are a popular choice and can be found on tap throughout Vancouver. Informal tours are offered and samples are cash only but be prepared to taste it standing up; there’s no lounge or place to sit. Established in 2013, 33 Acres (15 West 8th Avenue) has grown from a brewery into a dining destination. Known for its brunch and veggie-forward options, the avocado ‘smash’ toast and mint and kale salad might sound hipsterish but the 60-seater dining room is open to all, including (accompanied) children. There are food trucks outside for hungry visitors and it’s an easy walk to SoMa's (South Main's) best restaurants if you need more food. The beers themselves are the main attraction: ‘33 Acres of Sunshine’ is a citrusy hazy blonde beer that is a popular summertime tipple for Vancouverites. Always a favorite stop for thirsty cyclists that have been biking on the Adanac and Mosaic routes that intersect here, Bomber Brewing (1488 Adanac Street), is one of several great Vancouver breweries in East Van, clustered around Commercial Drive (a great place to eat, before or after). The vibe here is casual and cozy. Monday nights are Movie Nights with free popcorn and $5 pints and the Tasting Room is open daily from 12pm-11pm. Try the popular Pilsner that won them first place in the BC Beer Awards in 2017! Owned and operated by husband & wife team, David (Brewer) and Nicole (Operations), Powell Brewery opened as a nano (smaller than a micro) brewery in 2012 and the team quickly took home a 2013 Canadian “Beer of the Year” from the Canadian Brewing Awards for their Old Jalopy Pale Ale. Since then the selection has grown to include inventive flavors such as wheat beer with ginger and cardamom, cascara (coffee cherry) brews and gluten-free ciders. Check out the Tasting Room at 1357 Powell Street to try the classic Old Jalopy Pale Ale and some of the seasonal sips. Close to Bomber Brewing, Off the Rail (1351 Adanac Street) started as a way for founder Steve to share his love of craft brewing. His parents owned the famous Vancouver music bar The Railway Club and he introduced patrons to craft brewing there before moving to Mission in BC to grow hops when his parents sold the club. Now the handcrafted brews are available in the Tasting Room, alongside snacks from East Side Beer Food if you’re feeling peckish. Located just off the Adanac bike trail, it’s a great place to stop for a seasonal beer and a good story. Brassneck Brewery (2148 Main Street) offers great sample paddles and has knowledgeable staff — the small-scale brewery wants to keep things simple by just offering growlers to go, kegs and tastings on site at the Growler Room & Tasting Room. You won’t find any cans or bottles here. But you will find some ‘dangerously drinkable’ dry hopped sours, hazy IPAs and imperial stouts on tap. Outside is an ever-changing roster of food trucks to fill up at if you’re hungry after the beer tasting. Stock up if you like a beer — the casks are continually changing so they sell out quickly. Image Courtesy of Union Wood Co.
Postmark Brewing (55 Dunlevy Avenue) shares the beautiful heritage Settlement Building with Vancouver Urban Winery and The Belgard Kitchen so there are plenty of eating options available here for hungry visitors. All of Postmark’s canned beers are designed to be enjoyed in a session setting, so are light and approachable. Bottled seasonal sips range from apricot ale to spruce tip saison and can be enjoyed at the Tasting Room or taken home to savor. Big on branding, Postmark also has apparel and accessories for sale, and the website features everything from musical playlists to photographic collaborations. Housed in one of Vancouver’s only remaining industrial heritage buildings, Main Street Brewery (261 East 7th Avenue) is located inside the 1913 Vancouver Brewery Garage, which is in the historic Brewery Creek district where the original breweries once stood. Family-friendly and airy, the brewery Tasting Lounge is the best place to head for a filling combination of tacos and tipples. Try the chicken wings or charcuterie board, washed down with an appropriately named Main Street Pilsner, or dig into a plate of Little Mountain nachos with a Number Seven Saison.